Hurricane Florence slammed into the North Carolina coast early on Friday, September 14, 2018, wreaking havoc on anything and anyone in its 400-mile-wide path. In the coastal and surrounding towns of Wilmington, New Bern, Morehead City, and Fayetteville, North Carolina, the storm slowed to a crawl and unleashed torrents of relentless rain and wind. Now the state is dealing with catastrophic inland flooding the likes of which most residents have never seen. 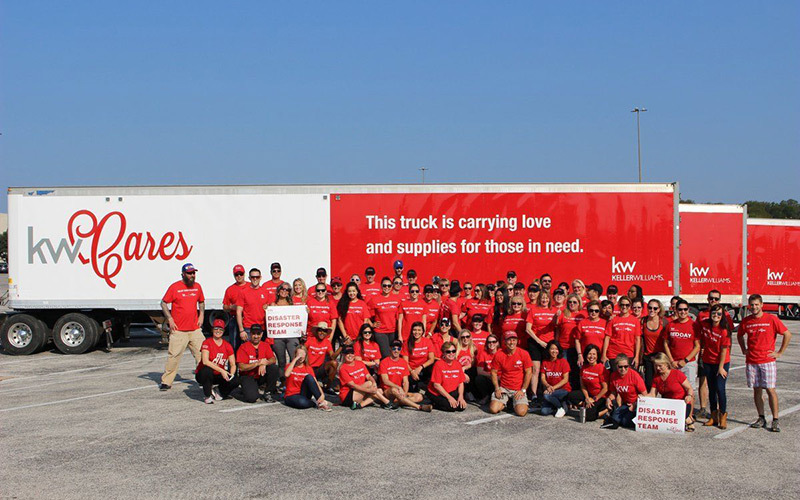 Days before the storm, Keller Williams’ leaders swung into action to ensure the safety of agents in partnership with KW Cares – a public charity that supports KW associates and their families. “Our number one goal was to communicate the need to evacuate and take care of their personal safety. Our secondary goal was to assess property damage and personal needs,” said Ladd Gasparovic, operating principal for Keller Williams Wilmington. Thanks to KW Cares’ disaster relief model, Gasparovic and others were able to quickly organize to help agents evacuate. Through social media, texts, and phone calls, they let every agent know that immediate funds were available through emergency grants from KW Cares to help them safely move away from the storm’s path. “The speed with which KW Cares got money into the hands of our people who needed it was remarkable,” Gasparovic recalls. Daniel Castro, a brand-new agent in Wilmington, received a grant from KW Cares just in time. His in-laws were visiting from Colombia, South America, for the imminent birth of his and his wife’s second child. At 39 weeks pregnant, a shelter wasn’t their best option, but it was one they would have to take if they couldn’t find an alternative. When KW Cares learned about Daniel and his family, they wired money into his account and connected him with host homes in Bristol, Tennessee, where they could safely wait out the storm and have access to a hospital. On Tuesday, September 18, the couple welcomed their daughter, Susanna Victoria Castro, into the world. Just days after evacuating, Singleton delivered a healthy baby boy, Matthew Isaiah Jenkins. To date, KW Cares has distributed 110 grants totaling $250,000 to those in need. Early last week, the organization set up a command center in New Bern to service the immediate needs of victims and over 100 volunteers have already assisted in clean up efforts. “The biggest thing we can do right now is not just about the physical possessions or generators we bring, but when we can put our arms around someone else, tell them it’s going to be all right, and get them working again with a glimmer of hope,” says Tom Freireich, head of operations for the KW Disaster Relief Team. As the rivers continue to rise, the worst of the flooding isn’t over yet. It may be weeks before power is restored and agents can return to their homes to evaluate the damage. Even so, Keller Williams will be there. When Mark Brenneman, regional director of the Carolinas, thinks of the support the region has received, he is overwhelmed with gratitude. To make a donation to those impacted by Hurricane Florence, volunteer, or receive assistance, please visit www.kwcares.org.